Sussman Shank routinely represents administrators and trustees in all aspects of trust and estate administration disputes, fiduciary issues, and litigation of complex estates and trusts. We also represent beneficiaries relating to their interests in estates and trusts. 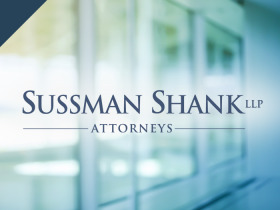 Sussman Shank recognizes the sensitive nature of trust and estate disputes, and we represent clients thoughtfully during contested probate or administration matters. We frequently resolve complex disputes between family members, beneficiaries, and fiduciaries. We are also experienced in helping individuals handle will contests, including cases that involve allegations of undue influence and diminished capacity. On behalf of trust beneficiaries, we successfully prosecuted claims against co-trustees, through and including a lengthy trial, which involved numerous witnesses, including expert testimony. The trial judge agreed with us that the trustees had breached their duties to the beneficiaries in a number of ways, including unilaterally, arbitrarily, and inaccurately declaring that a beneficiary was incompetent, failing to keep the beneficiaries reasonably informed about the administration of the trust, attempting to sell trust real property in order to pay themselves undisclosed fees, failing to properly manage trust property, and failing to, act impartially and with loyalty to the beneficiaries trust. The trial judge awarded our clients damages, and their attorney fees and costs, in excess of $300,000. We successfully defended the son and grandchildren of a deceased family patriarch against allegations in a will contest that our clients had conspired to unduly influence the decedent. After an eight-day trial, the trial court dismissed the will contest, granted our request to find that the claims against our clients had no objectively reasonable basis, and awarded fees and costs in favor of our clients. We represented trust beneficiaries in a consolidated appeal of multiple state court judgments granted in their favor, and against trustees whom the trial court found had breached their statutory duties to our clients. After a complex two-year appeal, which involved a trial transcript that was over 2,000 pages in length, the Court of Appeals affirmed the trial court's decisions and judgments, without opinion, in our clients' favor. We defended a trustee against allegations that the trustee had engaged in unlawful undue influence. We resolved the matter with our trustee client having no personal liability. We represented beneficiaries of a family testamentary trust in prosecuting claims against co-trustees. Our clients alleged that the trustees had violated their statutory duties by failing to administer the trust in a prudent and impartial manner. The matter settled favorably for our clients on the eve of trial. We represented a disabled protected person, by and through the protected person's agent/trustee, to obtain life insurance proceeds owed to a special needs irrevocable trust (established for the benefit of the protected person). We worked with counsel for other parties who were aligned with our client to obtain an Order for payment to our client's special needs trust and through which we also obtained payment of 100 percent of the life insurance proceeds owed to our client, plus accrued interest.